Taking risks. This is something a couple of friends have pointed out in my life. When I was first told this, I was very surprised. I have a very cautious personality. When I do something, I like to be assured of exactly how it will turn out. I want to know that people will still like me. I want to know that I won't mess up and ruin God's plans for me. So why do these people say I take risks? It seems to be because I'm not afraid to be different. I'm not afraid to share my opinions when I know they may not be popular among the people closest to me. I've taken a risk in writing this blog series, because I know my words may not always meet happy ears. Some people recognize my endeavor to organize a fundraising event, not knowing the outcome, and yes, that was a risky step for me to take. So although I don't see this frequently in my life, there is an element of risk present. Risk and responsible are two words that don't seem to even fit together. 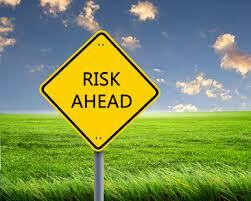 Risk is generally the opposite of responsible, so why did I choose to write about this? Because I think more young people need to take healthy risks. I'm not advocating going and doing stupid stuff and hoping there won't be negative consequences. Don't play with sin. Don't try things that will more than likely harm others or yourself. That's not responsible. I do think that there is a measure of responsible risk, but many of us are too afraid to try it. How about when it comes to obeying the Word of God? It's easy to obey God when we know the outcome, but what if we don't? Jesus never promised us peace and safety if we obey Him. We take a risk when we obey His commands. We take a risk when we sell all we have, give to the poor and follow Him. We take a risk when we share the Gospel in many parts of the world. We take a risk when we stand up for truth in North America, when we stand for life, when we speak out against various forms of immorality. We take a risk when we tithe when finances are tight. We take a risk when we trust God's will is best even when we can't see it and would rather go our own way. But how many of these risks do we as single people actually take? Are we willing to obey God when our friends may reject us? Are we willing to stand for truth alone? Are we willing to do something to make a difference in the world, even if no one supports us? What I'm suggesting is taking risks in doing good. These are difficult risks, but they stretch us and cause us to grow in our faith. They bring us closer to God and cause us to trust in Him more. They're not irresponsible. I believe these are the kinds of risks God would desire we take more often, and I believe we would grow in many areas of our lives if we did. This concludes my Responsible Single series. If there is something in particular you have been blessed by, feel free to drop me a comment.